ADi provides unrivalled services and consultation within the Contemporary Art, Exhibitions and Design sectors. "The brightness, image quality and minimal aesthetics of the EH7700 were perfect for the gallery... It needed to be cost-effective and reliable when operating eight hours a day for seven days a week." Challenge: To provide equipment capable of producing high quality video images in both landscape and portrait orientation that is bright but visually unobtrusive for South Essex’s contemporary visual art gallery, Focal Point. It needed to be cost-effective and reliable when operating eight hours a day for seven days a week. Solution: The EH7700 projector with its brightness of 7,500 lumens, WUXGA and interchangeable lenses, was the obvious choice. Two EH7700 were mounted using Unicol projector mounts from alloy scaffold bars and the images were projected onto suspended screens. Results: The brightness, image quality and minimal aesthetics of the EH7700 were perfect for the gallery. The first exhibition using the new projection system received excellent reviews specifically around its projected image quality. The gallery commissioned ADi Audiovisual Ltd, specialists in audiovisual installation for art galleries, to source and install a cost-effective projection system for its regularly changing exhibitions. It needed to be operational for an exhibition of synchronised video work to be screened between September and December 2013. The system had to be visually unobtrusive, bright (6,000-8,000 lumens), able to project high quality video images in both landscape and portrait orientation and be capable of running eight hours a day for seven days a week. The EH7700 projector with its outstanding brightness of 7,500 lumens, WUXGA resolution, ultimate reliability in 24/7 operation and interchangeable lenses, was the obvious choice. To cover the whole exhibition space two EH7700 projectors were mounted onto alloy scaffold bars using Unicol projector mounts. The location of the projectors and screens had to be extremely precise so a 3D model was made of the gallery space and the two projections mapped out within this. The images were then projected onto suspended screens. The gallery was delighted with the brightness, image quality and the fact the system was so visually unobtrusive. 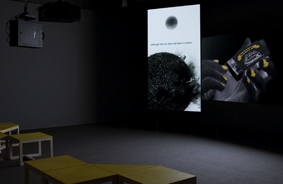 The first exhibition using the new projection system, Sunlight, a synchronised video work by Elizabeth Price, received excellent reviews specifically around its projected image quality with visitors to the exhibition commenting on the high quality of the installation and the image quality of the projectors. 2x Optoma EH7700, 2x ST1 short throw off-axis zoom lens, 1x Unicol landscape mount, 1x Unicol portrait mount, 3x Brightsign XD230 media player, Lindy HD BaseT extender via Cat6, Genelec 8040 active loudspeakers, Behringer graphic EQ, 1x additional flatscreen for countdown to next showtime.